We begin with our yummy CBV House Original scent in Gingerbread House, topped with a whipped layer in the same scent. 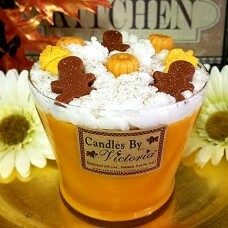 We than garnished this sweet Fall inspired candle with wax pumpkins, acrons and gingerbread men. This candle is just so cute and smells so amazing, if you are a pumpkin and gingerbread lover, this is a must have candle for your collection.